About FOSTER a German Shepherd Dog! There are many special German Shepherds without permanent homes who need someone willing to help give them a second chance. Fostering a Rescue dog and being the way-station to its new life can be one of the most fulfilling experiences you will ever have. All food for the foster dog. All authorized veterinary care for the foster dog. Obedience Training opportunities for you and your foster dog at no cost. Support and aid for any questions or behavior problems you might encounter with your foster dog. Loan of a crate for the foster dog. We encourage crate training for our foster dogs, as it provides a secure transition for them into their new homes. If needed, we can also provide information on proper crate use. The knowledge that you are giving a German Shepherd Dog another chance to find a loving, safe home! If you want to try fostering a dog, please e-mail us at foster@gsrnc.org, and start the foster home application process today! Foster homes must be located in Northern California, preferably in one of the following counties, Alameda, Contra Costa, Marin, Monterey, Napa, Sacramento, San Benito, San Francisco, San Mateo, Santa Clara, Santa Cruz, Sonoma, or Yolo. It is easier for everyone if foster homes are close to Adoption Event locations, which are currently held in Danville, Redwood City, San Jose and Woodland. If you do not own your home, you need your landlord's written permission to have a foster GSD in your home. You also need written permission from any roommates. Foster homes should have a securely fenced yard area for the dog's safety and your convenience. A kennel run is usually not acceptable. If you do not have a fenced area, you may still be eligible to foster dogs; this will be decided on a case-by-case basis. Please note that the Invisible Fence alone cannot be used for foster dogs, as most GSDs will run through the boundary. The fosterer's home environment must be appropriate for the foster dog. We consider the fosterer's own dogs, other pets, and any children in the home. Fosterers need to be understanding and patient enough to commit to fostering a dog until it is placed in a permanent home. While the typical placement time for a GSRNC dog is about three to four weeks, sometimes dogs are adopted out in much less time. We do look for short-term foster situations once in a while, but our most urgent need is for long-term foster homes. As a fosterer, you will have the full support of other experienced foster-volunteers. Fosterers need to stay in contact with our Foster Coordinator, provide updates on their dog's progress, and ask for any help they may need. We know that foster dogs can sometimes test your patience, especially at first while you are learning about their needs and they are learning about their foster home. 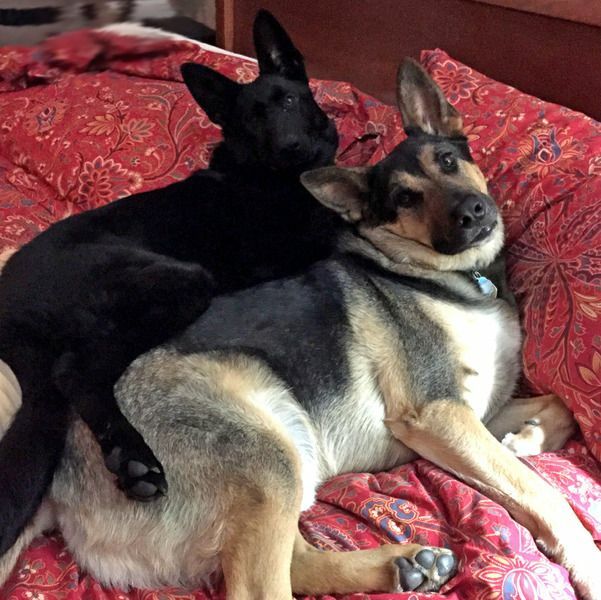 Living with a foster dog in a home environment, however, and learning as much as possible about its personality and temperament, is the best way to help find a good, permanent home for a Rescue German Shepherd. Fosterers must be willing to take their foster dog to the geographically nearest Adoption Event, currently once a month. If you are not able to drive the dog to the event, we will try to arrange transport. Fosterers must be able to allow reasonable access to the dog for meetings with Potential Adopters. Please e-mail us at foster@gsrnc.org or apply here http://www.savegsd.org/vol_quest.asp. Log in to see who is volunteering for FOSTER a German Shepherd Dog! !